Stress is a tricky subject for a number of reasons. It is pretty broad term. When we talk about stress we could be talking about physical, mental, emotional or environmental stress. Some people can withstand a huge amount of stress and seem to thrive on it. Whereas for other people the smallest amount of stress is barely tolerable. We actually need to able to withstand stress, in order to become stronger. Stress isn’t inherently bad, yet how our body-mind systems deal with it is critical. But how much is too much and how do we know? If we can recover from stressful incidences well, rather than staying stuck in stress, then we will suffer few ill consequences. However, if we fail to recover from the stress then we do have a problem. This failure to recover can happen if the stressful incident was very extreme, as in PTSD (post traumatic stress disorder). The high alert part of the brain (the amygdala) goes into overdrive and sets it’s alarm bell off to frequently. In PTSD the alarm bell rings (the amydala sets off a stress response) even when situations are not inherently dangerous. This is an extremely exhausting and distressing state to be in. Recovering from prolonged stress can also be very difficult, although less obviously distressing than PTSD. With prolonged stress, we simply lose the ability to switch off the “fight or flight’ mode of our autonomic nervous system. It is like we have our foot stuck on the accelerator pedal and we can’t work the brake. This kind of stress builds up over time. It can be associated with low mood and a feeling of being stuck or trapped in a situation that we don’t want to be in. This situation raises cortisol levels. This is the kind of stress that occurs when we don’t give ourselves the rest and recovery we need in between bouts of hard work, long hours, juggling work and family commitments coupled with emotional stress. Contrary to popular belief, drinking wine and watching TV is NOT relaxing! Our nervous system is very stimulated by both the content and the blue light of our TV and computer screens. Drinking wine messes with our blood sugar levels and hormone levels. This can potentially disrupt a good night’s sleep. When we persist these habits, we overload the glands that make our stress hormones, our adrenals. This can lead to adrenal stress and this has knock on affects for our nervous and circulatory systems. Often we don’t realise what’s happening until we get ill. Symptoms of stress range from heart conditions, to immune system problems to inflammatory illnesses, insomnia, IBS, chronic fatigue, chronic pain and burnout. Thankfully nowadays, we have an incredibly important biomarker for measuring how well we recover from stressful incidents of all kinds. We can use it to track our stress to make sure we keep it within manageable levels. Heart Rate Variability, or HRV is a measurement which can determine whether or not elite athletes are at their peak performance for important events. Nowadays, top companies are utilising this technology to find out more about how their employees are affected by stress. Utilised ethically, such monitoring is a fantastic step in the right direction. You can, for very little investment, measure your own HRV by getting a heart rate monitor and using it with this app. Our heart rate, although around 60 BPM for most adults, is not a steady fixed beat like a clock ticking, it varies according to our breathing. As we exhale the beats have slightly longer intervals between them, and as we inhale the intervals are slightly shorter. This effect relates to our autonomic nervous system (ANS). The ANS switches between “rest and digest mode” (parasympathetic) and “flight or fight mode” (sympathetic). When our HRV is high we can go back to rest and digest quickly after a stressful incident. When our HRV is low we are more likely to get stuck in the “flight or flight” mode, even if we are trying our best to relax. The time-tested methods of Yoga, especially the breath practices, are validated by this modern biofeedback technology. Bessel van der Kolk, a world-renowned researcher and clinician in Post Traumatic Stress Disorder, devotes a whole chapter to yoga in his book The Body Holds the Score. This is based on his extensive research into the benefits of yoga for people who have suffered trauma. Researchers have discovered that by breathing around 5-6 breaths per minute we can increase our HRV over time. 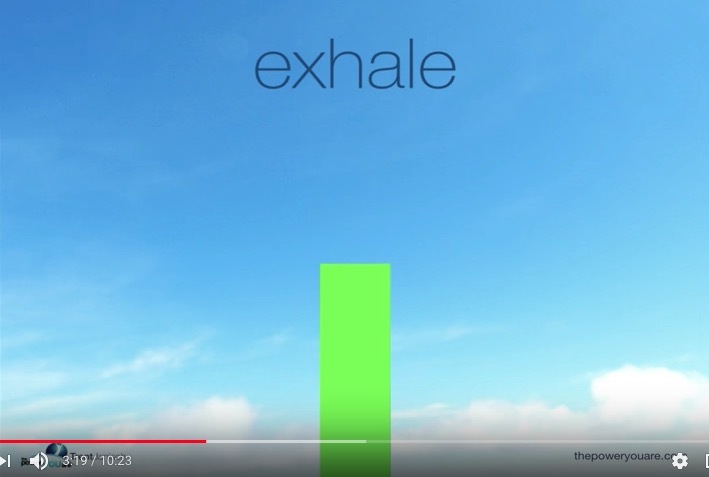 Here is a simple youtube video to help you establish this coherent breath rhythm. As we get more used to breathing in this pattern unconsciously our HRV comes into balance and our vagus nerve (the nerve that switches on all the “rest and digest processes”) becomes more toned. A toned nerve is like a toned muscle, it’s not to over stressed or under stressed, it is in perfect dynamic balance. The vagus nerve is a highly complex nerve that “wanders” from the brain to the gut, heart, spleen, liver, gall bladder, ovaries, kidneys, throat and eyes. If we can increase the tone of the vagus without over stressing it, we can greatly improve issues such as IBS, inflammation, allergies, heart conditions and resilience to stress. Other ways of toning the vagus nerve (apart from coherent breathing) include singing, gargling, humming, chanting, meditation, massage (especially foot and neck and shoulders massage). These are all either yoga or Ayurvedic practices. The yoga philosophy offers ways of contextualising difficult situations so that we may see the benefits we might draw from adversity, but this is a subject for another post! By having a regular yoga practice you are supporting your ability to withstand and adapt to stress. Consciously addressing the stress with self care techniques can help us to gain control of the experience. We consciously act instead of unconsciously reacting to the stressor. Interventions such as breath focussed meditation (three part breath); mantra practice or slow asana practice can bring us back to parasympathetic mode. Instead of being depleted by the experience we find that we can grow stronger and wiser and more able to flow with the ups and downs of life.